Subway definitely keeps it fresh and I figured out how. Every single one of their items on the “6 grams or less” menu has preservatives to keep it …well…fresh! 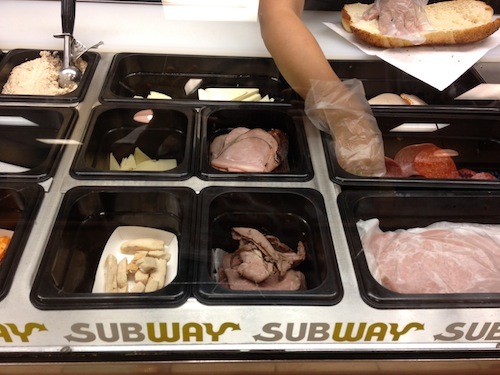 Sure Subway makes your meal right in front of you, but what is really happening behind the scenes? Boxes of already cut up and prepackaged processed foods and chemical additives are being shipped from Big Food industry factories to each location. 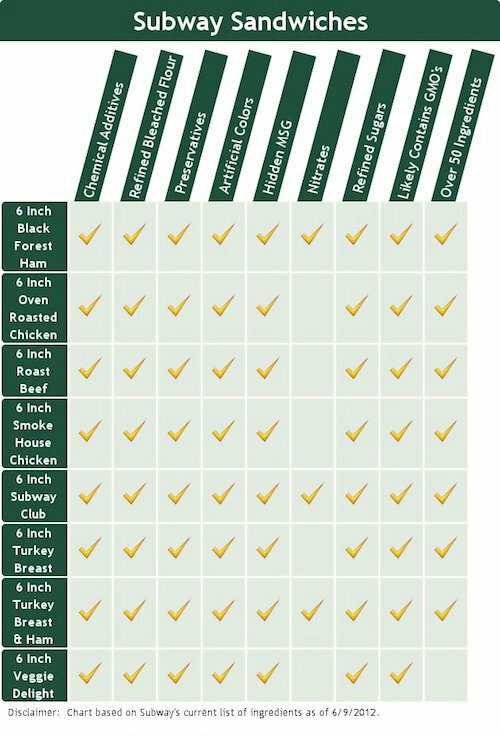 The 9 grain wheat bread might look and smell freshly baked but it contains close to 50 ingredients including refined flours, dough conditioners, hidden MSG, refined sugars, etc. Could bread this processed ever be realfood? Certainly not, when it includes a chemical ingredient called azodicarbonamide, which is banned as a food additive in the U.K., Europe, and Australia, and if you get caught using it in Singapore you can get up to 15 years in prison and be fined $450,000. Azodicarbonamide is more commonly used in the production of foamed plastics, however, it is allowed in the United States as a food additive, a flour bleaching agent, and a dough conditioner that improves elasticity of bread. The U.K. has recognized this ingredient as a potential cause of asthma if inhaled, and advises against its use in people who have sensitivity to food dye allergies and other common allergies in food, because azodicarbonamide can exacerbate the symptoms. Let’s not forget it only takes 4 or 5 simple ingredients to make REAL whole-wheat bread including flour, yeast, salt, water, and maybe honey. Three sandwiches on this menu, along with several other menu items not listed, are comprised of processed meats and filled with nitrates and forms of MSG. The consumption of nitrates need to be taken very seriously. Nitrates are frequently converted into nitrosamines, which have been proven to increase the risk of disease dramatically. The latest research from World Cancer Research Fund declared that “processed meat is too dangerous for human consumption.” Studies have shown it may only take 1.8 ounces of processed meat (about half of what is in a typical 6 inch sub) daily to increase the likelihood of cancer by 50%, heart disease by 42% and diabetes by 19%. I still know people who eat Subway for lunch everyday, but I’m glad I don’t know anyone on the actual Subway Diet. Sheesh. I can’t imagine what their percentage would be, could you? 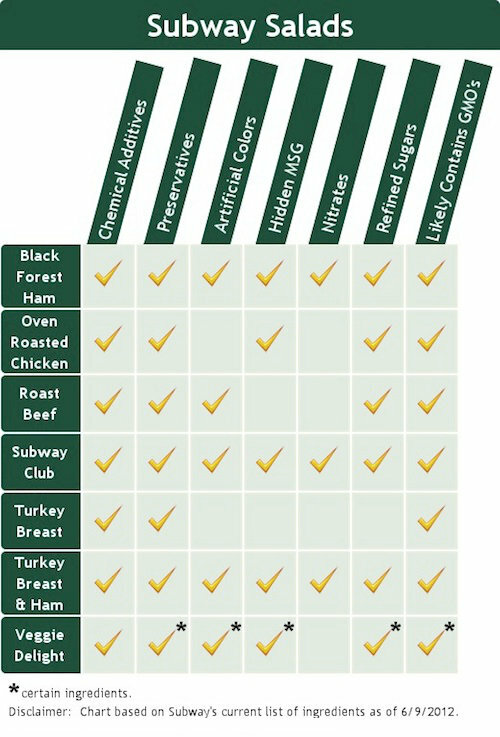 Can you believe the American Heart Association is now putting their seal of approval behind these processed meat based Subway menu items? WOW. After all these studies that show an increase in heart disease? Is this a joke? Even the processed turkey meat that seems harmless because it doesn’t contain nitrates is full of preservatives, chemical flavorings, and carrageenan. I wrote about carrageenan last month after the Cornucopia Institute revealed a study that once the food grade version of carrageenan is ingested it turns into a carcinogen in your digestive system. Preservatives and even artificial colors are added to many of their “fresh” vegetable offerings – like the banana peppers and pickles. The ingredients for the black olives unveiled a new additive I learned about, “ferrous gluconate,” which is an iron based preservative that helps keep olives black. While the “6 grams or less” menu says the totals don’t include cheese or salad dressings, it is important to know that some of the cheeses offered at subway also have artificial colors, preservatives, and even cellulose that’s made from wood pulp. Two of the healthiest sounding salad dressings were actually the worst based on my analysis. Fat free honey mustard and the red vinaigrette both have corn syrup, artificial colors, preservatives, and other chemical additives. To top it off, the majority of foods at Subway have been conventionally sourced and probably include pesticides, antibiotics, and/or growth hormones. In my research, I didn’t find one single organic ingredient or menu item available at over 36,000 stores. Even the lemon juice comes in a pre-packaged squirt pack filled with preservatives. Because of this I haven’t consciously ever considered going to a Subway in the last 7 years. Last weekend, I broke this streak and went into a Subway in search of real food. I have to admit the thought of going into a Subway and ordering off the menu was a little bit daunting, but I decided this was the best way to get the answers to my questions, like whether or not their avocado was really fresh or not. Could it be possible for me to order something and actually take a bite without squirming? ​Going against my “vote with your dollars” philosophy and purchasing something from the “bad guys” went against every bone in my body. But I did it. Watch it all unfold in the video below. Everything at Subway may not be “fresh” but if you are ever stuck on a deserted island and this was the only place you could eat… now you know what to order.